As I walked back over Knippelsbro this evening there were several very loud booms, a mass of smoke, the sound of drums beating the attack and I realised that there was a naval battle in the harbour beyond the bridge with the tall masts of sailing ships emerging from the gloom and all immediately in front of the Black Diamond … the Danish National Library. And no - I wasn’t heading back from a bar and no this sort of thing certainly doesn’t happen on a Saturday evening on Euston Road immediately in front of the British Library … which is a pity. This was a re-enactment of a battle in 1717 commanded by the famous Danish naval hero Peter Tordenskiold … a nobleman from Trondheim and actually christened Peter Jansen Wessel but his exploits earned him the nickname Tordenskiold or Thunder Shield which somehow seems more appropriate. After a dash back to the apartment to get a camera I took a few photographs. I always have a camera with me, or nearly always, but for once, on a gloomy evening - nipping out to buy tea bags - I hadn’t expected to come across a naval battle. 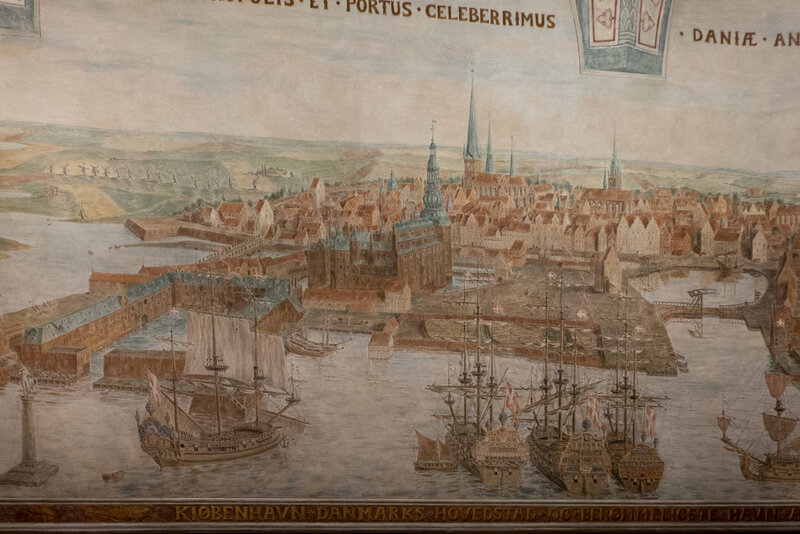 Since the time of Tordenskiold the harbour has been narrowed as quays have been built out from the Christiansborg side and from the Christianshavn side and the massive building of the 17th-century Royal Arsenal is now a museum. The tightly enclosed area, the square basin, alongside the Arsenal and below the castle - where the battle ships of the navy of Christian IV pulled in to load with gunpowder and beer - is now filled in and is now the gardens between the parliament buildings and the National Library and the area where the first major shipyards were, where the fighting ships were built - close to the naval church of Holmen - is the site of the National Bank designed by Arne Jacobsen. If you think that a naval battle has little to do with design then you would be wrong. The architecture of Christian IV - including the Arsenal and the great brewhouse from the early 17th century - were some of the first major industrial buildings on a truly modern scale and the great fighting ships and the merchant fleet of Denmark through the 17th and 18th century were some of the best and some of the most powerful in the western world, depending on up to date design, advances in technology and the most amazing skill from carpenters, metal workers, sail makers, rope makers and so on. There are records of Christian IV taking his latest war ship to England to show his brother-in-law King James and his nephew Prince Frederick just what Danish ship builders could do and show them how much faster and how much better the up-to-date technology of Denmark was than anything being built in London. Not exactly a trade delegation to promote Danish design but along the same lines. And Tordenskiold? He died in 1720 just a few weeks after his 30th birthday, in a duel where the evidence suggests he was betrayed and set up to loose.